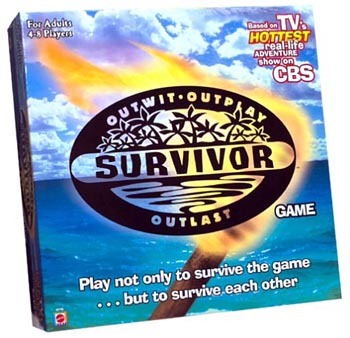 Board Game from the Survivor Television Show. Based on the wildly popular first season of the Survivor TV series, this multiplayer (four to eight adults) game adopts the basic premise of the show as players rely on quick wits, as well as pure luck and the collective vote of the Tribal Council, to become the game's sole survivor. With a plastic replica of the island of Pulau Tiga as its centerpiece and cardholder, the game is played on an illustrated game board and comes complete with 168 game cards in three different categories of questions and riddles, as well as some Pictionary-type cards. The game also includes a special die, 10 playing pieces and stands, nine erasable voting cards, an erasable pen, immunity idol, and an instruction sheet. This exciting new adult board game plays just like the TV show with both team and individual play - You can even vote members out of the game! The object of the game is to be the only remaining player to survive the game, and up to eight people can play at one time.